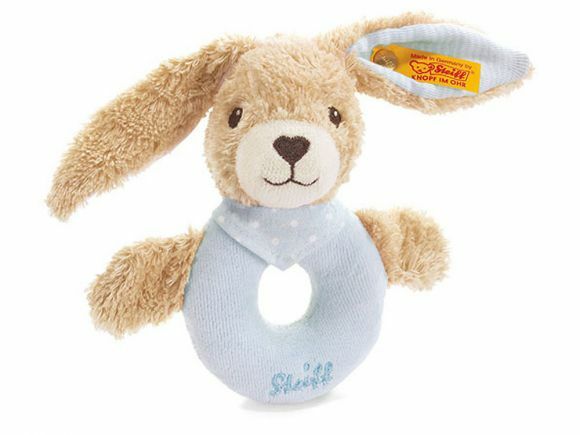 Steiff EAN 237485 Hoppi Rabbit, 20cm. 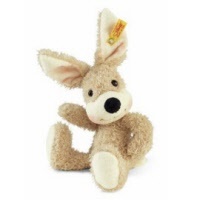 Steiff EAN 080241 Mr Cupcake rabbit beige 22cm/ 8.8". 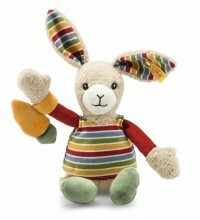 Mr Cupcake is a lovely rabbit, a real friend for all kids. 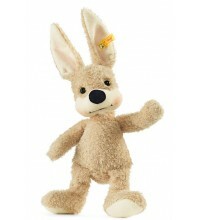 He is made of beige coloured cuddly soft plush, has safety eyes and a plush nose. He is filled with synthetic stuffing material and Machine washable (30 degree C). He is with the CE mark for safe toys. Steiff EAN 080265 Mr Cupcake rabbit beige, 28cm. Steiff Hoppel Rabbit pink 20cm. 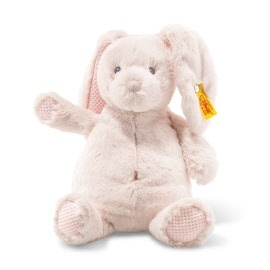 Steiff Baby EAN 237577 Hoppel rabbit pink, 20cm. 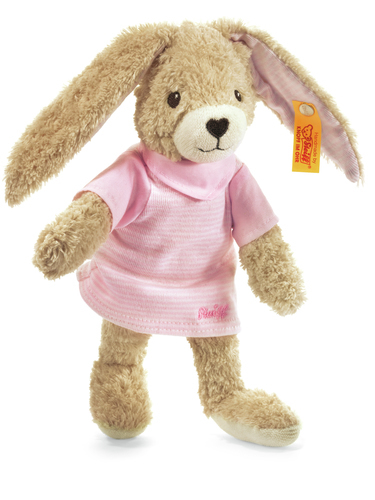 Steiff Hoppel Rabbit pink is made of fluffy, certified organically grown cotton. She is dressed with a pink/white dress, has embroidered eyes and a brown heart shaped plush nose. She is filled with synthetic stuffing material and machine washable at 30 degrees C. She has the CE mark for safe toys and is 100% safe for your child. 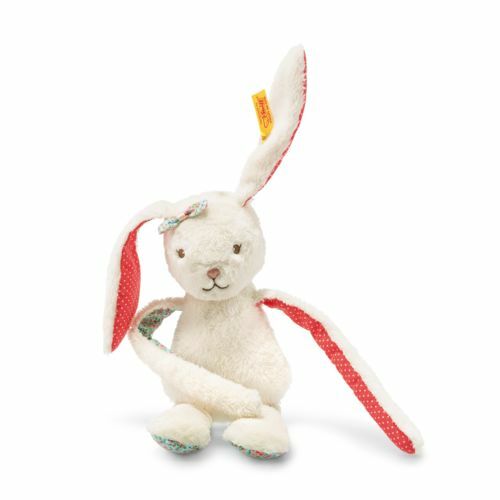 Steiff EAN 240300 Carrie Rabbit, 28cm. 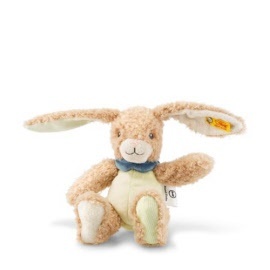 Steiff Carrie Rabbit is 28 cm. / 11.2" tall and made out of baby soft skin plus in the colors beige / red and green. Carrie is holding a rustling carrot in her right arm and her arms and legs can be changed in length. 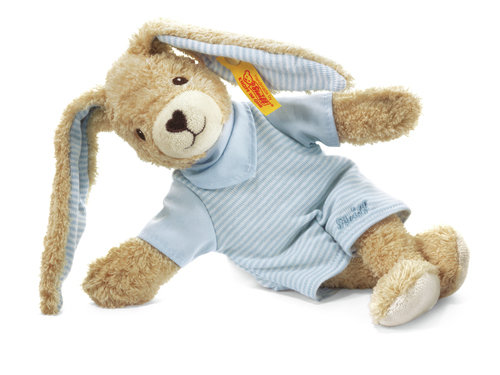 Steiff EAN 241093 Blossom Babies Rabbit, 26cm. The Rabbit is made of white plush for baby-soft skin. He has embroidered eyes and is stuffed with synthetic filling material. He is machine washable at 30° C and has the CE mark for safe toys. He has a stainless steel “Button in Ear”. 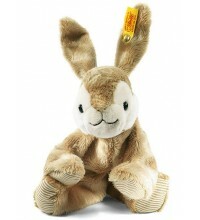 Steiff EAN 240317 Friend finder Rabbit, 25cm. 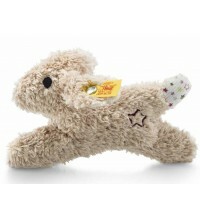 Rabbit with rustling foil is made of cream/green plush for baby soft skin. He has embroidered eyes, is machine washable at 30°C ans stuffed with synthetic filling material. He has a stainless steel “Button in Ear”. Rabbit can be registrated at: www.code-no.com/steiff den Knister-Teddybär. So if he gets lost, his finder can put the code there also so Rabbit could come back to you. Steiff EAN 240706 Belly rabbit Soft Cuddly Friends, 28cm. Belly rabbit gives warmth and comfort. The 28 cm tall rabbit has two funny pink ears which provide comfort and softness. It's a wonderful present for a newly born and on many other occasions.